I have to say that I can clearly see the diamond in this quilt block, but can't really see a star. But, if you are inventive you might choose to switch up all the colours and a star might just appear in this Star in Diamond quilt block. All that being said, it is quite a lovely block, with lots of possibilities and is constructed as an uneven nine patch. Also, this would be a good choice to practice up on making those flying geese patches. The flying geese unit is probably the third or fourth most commonly used patch in quiltmaking. 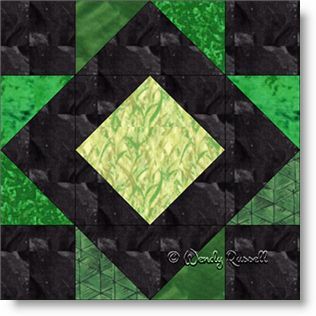 The two sample quilts illustrated give you ideas on setting your blocks side by side in a straight setting, or on point with additional blank blocks to show off your quilting stitches. Once again, there is no limit to the creativity you can experience by adding more blocks, or even an additional colour.